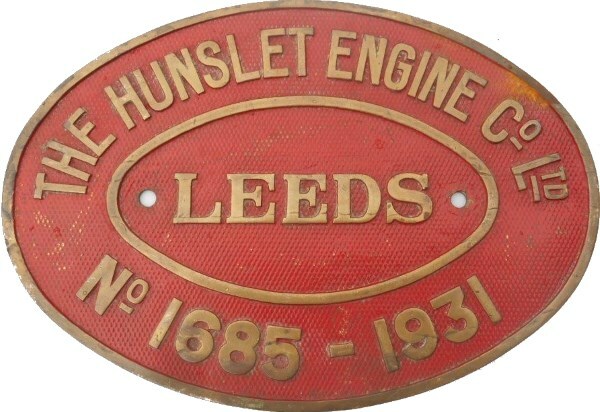 Lot 31 Brass Oval Steam locomotive Worksplate "THE HUNSLET ENGINE CO LTD - LEEDS No 1685 - 1931". As carried by a 0-6-0ST Loco Named "NUTTALL". New to contractor's, passed from Molem to the NCB at Coppice Colliery in 1950. Used at numerous collieries in the Cannock Case area including -West Cannock, Hilton and Littleton. Scrapped at Lea Hall, Rugeley 8/66. Size 11".5 x 8".As removed condition.